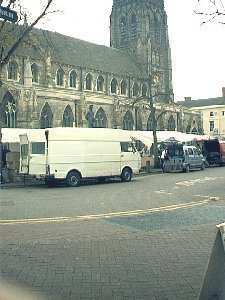 Markets are still held on the historic Lichfield Market Square – where they have been since King Stephen granted the first charter for a market in 1153. 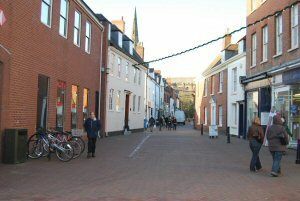 Market days in Lichfield are Tuesday, Friday and Saturday when all is bustle and hurley burley, with a Farmers' market on the first Thursday of the month, except January. The statue of Boswell can just be made out over the top of the white trader's van, with the backdrop of St Marys Church. On the wall of the church can be found the plaques commemorating the last martyrs burnt at the stake in Lichfield Market Square. St Marys still has a Sunday service at the East end of the church, but it now houses a Day Centre for the elderly, a tourist shop where you can get all those little reminders of your time in Lichfield, a cafe, and upstairs there is the Heritage Centre. The Heritage Centre is a history of Lichfield where an hour or two can be well spent, and if you are athletic, for a very small fee - a guide will take you up through the old bell tower and up into the spire loft where you can look out of the upper windows over the roof-tops and out into the countryside round about. 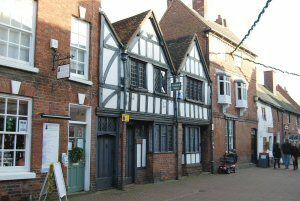 The Tourist Information Office is now contained within the Heritage Centre. Tourist Information centre opening hours: Monday to Saturday 9.30am - 3.30pm (01543 256611). The City Centre is pedestrianised so that you can wander round at your own pace. Dam Street at the top of this page is a typical narrow street with its quaint old shops, looking back towards the Cathedral. 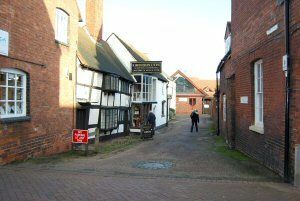 Below, is Quonians Lane with the old antique and craft shop in the cul-de-sac leading to one of the ancient Wood and Stone carving workshops, now modernised, that still supports the Cathedral maintenance work. As we go up Dam Street towards the Cathedral, we see on the right - Brook House. 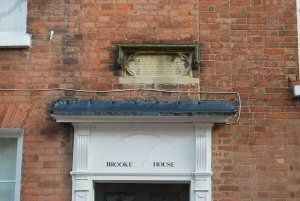 The tablet over the door tells us that it was here that during the Civil War, a lucky shot from the top of the defended Cathedral, shot and killed Colonel Brook of the Roundhead (Parliamentarian) force that had surrounded and were attacking Lord Chesterfield and the Cavalier (Royalist) defenders. Much damage was inflicted on the Cathedral and at this time it lost it's main spire amid the frenzied destruction. Further on to the left up Dam Street, is Minster Pool which fronts the Cathedral, and Pool walk where you can sit in the gardens and feed the ducks. Nearer the Cathedral on the right again, is the old mill which is now a solicitors office. 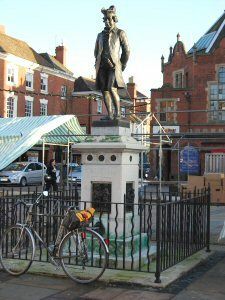 Back in the Market Square and with his back to St Mary's Church, we have another statue, this time to Dr Samuel Johnson, the essayist, letter writer, and dictionary compiler, facing the building on the right above which is his birthplace. Click [ HERE ] to visit the Home of the Johnson Society (Lichfield). 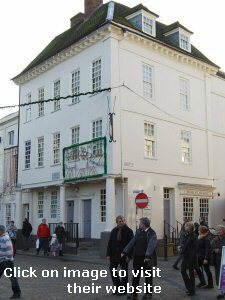 There is a good collection of items well worth a visit in the birthplace museum, and they will be pleased to show you around on a tour of the building which is kept in period. 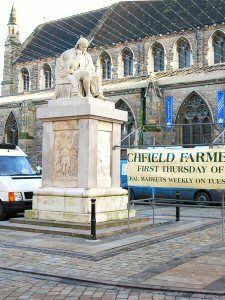 On the right, Boswell's statue that stands at the left hand end of the market Square with his back to St Mary's. In the background to the right hand side, we can just see the back end of the Corn Exchange, much used by merchants in the City's past, and now a restaurant on the first floor, with kiosk shops below on the ground floor. A better view on the next page. 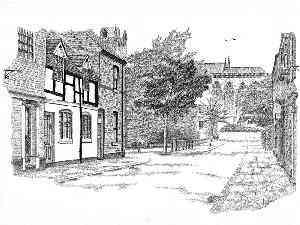 And above, Dam Street towards the Minster Pool end, an ink drawing by Eric Chapman who used to holiday in Lichfield during the war years, and has a fine web site devoted to his sketching which you can visit [ HERE ]. Last updated: November 18th, 2015.